Emi is a set designer who enjoys being behind the scenes but can’t seem to find the movie magic she craves in her own life. When she stumbles upon a famous movie star’s letter to his estranged daughter, Emi and her best friend Charlotte follow the mystery to Ava, a troubled and talented actress on the cusp of her own career. Emi is drawn to Ava, and as their mutual attraction heightens, Emi discovers the true magic of romance. Everything Leads to You is a beautiful, romantic, and emotionally compelling story with a wide cast of vivid characters. LaCour’s strong imagery helps anchor emotion to particular settings in this novel; the lush safety of Emi’s apartment, the loneliness of the desert that Ava ran away from, and the empty opulence of Ava’s new apartment have strong emotional ties to each character’s story arc. All these settings are particularly meaningful as the set designer in Emi is especially attuned with places and how they reveal character. The emotions of this story are written perfectly, and the romance between Emi and Ava builds beautifully as the plot unfolds, bringing them closer together against believable odds that thankfully have nothing to do with their sexuality. Everything Leads to You realistically captures the disappointments of growing up, the exhilaration of first love, and the magic of true connection through an unconventional lens. Cover Comments: I love this cover so much--it's so gorgeous and soft and light. The city skyline along the ending is also perfect. 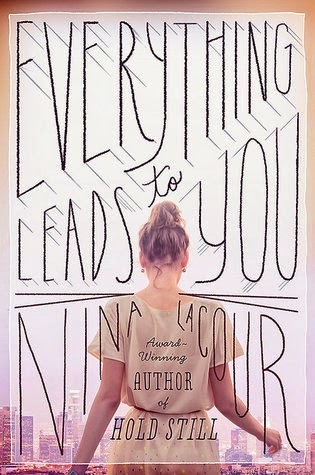 Everything Leads to You is out May 15th, 2014!